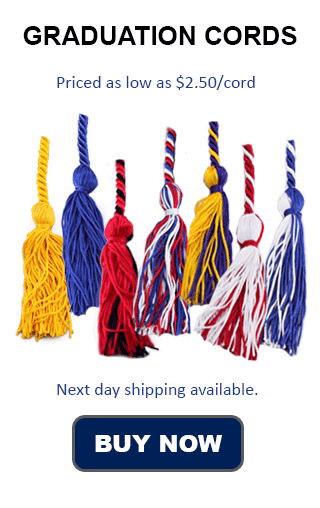 Choir Graduation Cords can be of any style or color depending on the school and the choir. One color that is often used is pink, because it is the color used in college for music majors. A Double Pink Honor Cord is used for a student who is a member of Tri-M Honor Society, which is a high school Music Honor Society. There is a collegiate Choral Honor Society at Tuskegee University called Pi Sigma Phi. Pi Sigma Phi's colors are orange and black. At Honors Graduation we carry pink honor cords, orange and black honor cords, and a variety of other colors to meet your needs not matter what your choir, school, society, or academic level is. There are several different types of choir for which honor cords can be worn. A choir is a group of singers who perform music together. Other words for choir include chorale and chorus. The most common type of choir is a mixed choir with male and female voices. The singers are split up into Soprano, Alto, Tenor and Bass (SATB). There are also Male Choirs, Female Choirs, and Men's Choirs or Chorale. A Barbershop Quartet is an example of the latter. There are also Children's Choirs, including boy choirs such as the Vienna Boys Choir. School choirs can often be Gospel Choirs, Show Choirs, Symphonic Choirs or Vocal Jazz Choirs (Jazz Chorus). In Show Choir the choir not only sings but dances and performs as well. Often telling some sort of story or portraying a feeling or mood. Don't forget your art students! Be sure to check out our page with suggestions for National Art Honor Society cords.